And the Seasons – AIDS-3D’s first solo exhibition in Norway – will feature two installations that resonate Internet technology, money markets and clairvoyance into a mythic-past. Will Be (2009) is best described as a live sculpture. During the gallery’s opening hours, an oracle - sitting in the exhibition space, in a haze of incense, draped only in a gauzy fabric – will divine the future by reading all the Twitter messages with the words "will be," tapping into the hive-mind of the Internet instead of the Gods. Alpha (2010), a piece developed expressly for the exhibition at 0047, confronts viewers with the arbitrary distinctions between the physical and the abstract. 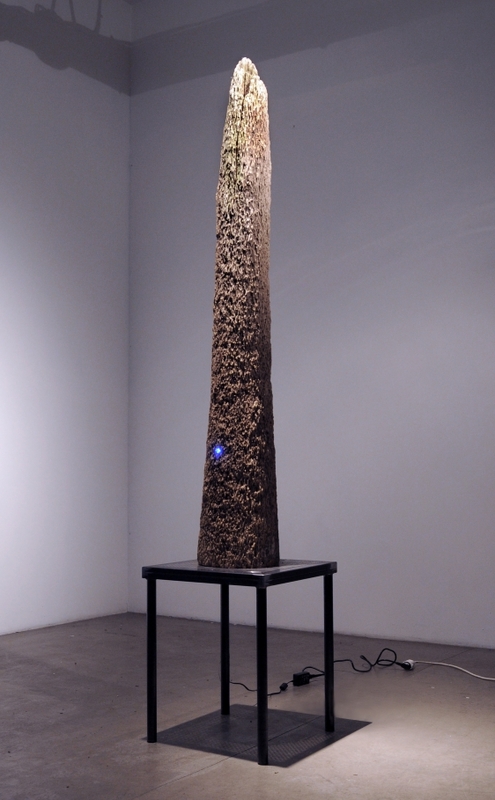 A mico-PC computer that is programmed to automatically trade stocks is inserted into a piece of weathered driftwood, conflating the immediacy and physicality of the wood with the digital computations performed by the computer. A LED light is inserted into the weathered driftwood; it signals blue when there are no current transactions; red when it’s losing money and green when making money.